Nissan may sell credits earned in the past two years from its battery-powered Leaf, the best-selling all-electric car in the United States. LOS ANGELES -- A new front is opening in the emerging market for electric vehicles -- not for selling cars, but for credits required to meet clean-air rules. Starting this year, California is requiring the biggest automakers to sell increasing numbers of "zero-emission vehicles," or ZEVs, such as pure-electric, plug-in hybrid and hydrogen-powered autos. Companies that fail to meet their quotas have the option of buying ZEV credits from rivals that exceed their targets. Nissan Motor Co. says it may sell credits earned in the past two years from its battery-powered Leaf, the best-selling all-electric car in the United States. "We are in a fortunate position of having positive credit, so that's obviously something we are able to look at," Andy Palmer, an executive vice president, said Tuesday at the carmaker's headquarters in Yokohama, Japan. "We are exploring some plans, but we haven't announced anything yet." Tesla Motors Inc., the startup led by billionaire Elon Musk, revealed in a June 2010 filing that it had sold credits to Honda Motor Co. and another automaker it didn't identify. Tesla didn't disclose the number of credits sold or the price. The regulations affect auto sales in 11 other states -- including New York, New Jersey, and Massachusetts -- that follow California's rules. Regulators expect the six largest carmakers to sell a combined 60,000 zero-emission autos in those 12 states through 2014, and a cumulative total of 1.4 million by 2025. Automakers earn credits for electric and plug-in hybrid vehicles sold in those states to meet thresholds based on their sales in California. Failure to get enough credits can lead to fines or even limits on their ability to sell cars. "This is a way to address California's unique air-quality issues and reduce greenhouse-gas emissions," said Dave Clegern, a spokesman for the California Air Resources Board, which runs the ZEV program. "We think there'll be growing demand for the vehicles and it's a framework to get them to customers." The burden is heaviest for Toyota, which has the largest market share in California, followed by Honda, Ford Motor Co., General Motors Co., Nissan and Chrysler Group LLC. Credit prices and sales are negotiated between the seller and buyer, and there's no requirement by California to disclose them, Clegern said. While Tesla and other companies declined to say what a credit might be worth, each one can help an automaker avoid thousands of dollars in fines. The number of credits per vehicle depends on its range and how fast the battery can be recharged. A model with a 100-mile range and standard charging, such as a Nissan Leaf or electric Ford Focus, would generate three credits, while a long-range, fast-charging Tesla Model S can get seven. Tesla received more than $13 million for credits transferred to Honda and other manufacturers, the company's filings show. "We have credits to sell to companies that may need them, and we're not going to identify them" beyond Honda, said Diarmuid O'Connell, vice president of business development for Tesla. 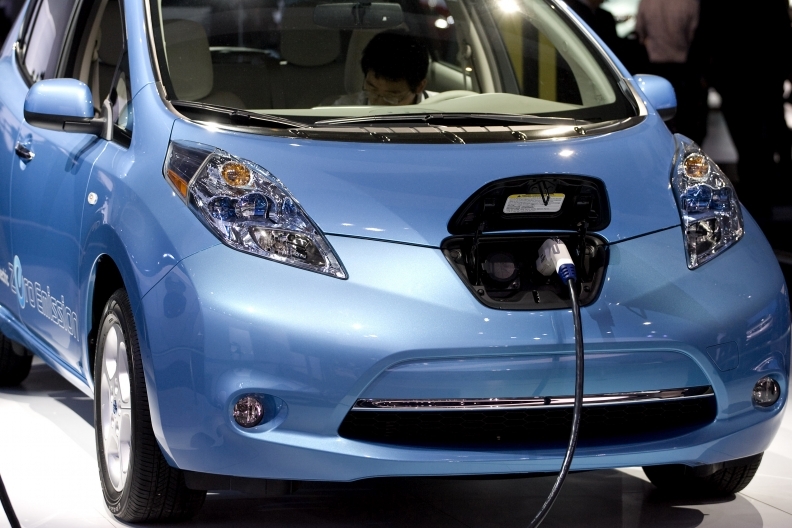 Companies with ZEV credits to spare may be eager to sell them. Credits earned from 2009 through 2011 begin to lose value after three years, while those earned from 2012 onward don't expire and can be saved for future use, encouraging carmakers to deliver more ZEV-compliant models than required under each phase of the program, Clegern said. "Some manufacturers who maybe aren't getting their ZEV into the market as early as others will be looking for credits if they can find them," said James Lyons, an analyst at Sierra Research Inc. in Sacramento, California. While Honda's vehicle line ranks among the most fuel- efficient in the U.S., the Tokyo company faced a credit shortfall in California because it sold fewer FCX Clarity fuel- cell sedans than it planned. Honda bought Tesla credits from 2008 to 2010 to ensure it avoided fines. No further such purchases are planned, the company said. Honda expects to begin delivering all-electric Fit small cars in California late this year, and it's adding a plug-in version of its Accord sedan. Chrysler may also need to purchase credits. The third- largest U.S. automaker has the most truck-heavy lineup, lags behind others in selling cars with alternative powertrains, and has been gaining share in California's auto market. Chrysler isn't "wedded" to pure electric vehicles like Nissan is and probably won't invest heavily in a costly program similar to Leaf, said Larry Dominique, executive vice president of TrueCar.com. Most of the credits Chrysler held as of October 2011, the last reporting period, came from a unit that made low-speed electric cars and was sold last year to Polaris Industries Inc.
Chrysler, majority owned by Italian automaker Fiat SpA, starts production late this year of an electric version of the small Fiat 500, said Tim Kuniskis, president of the brand for North America. He declined to provide details of the vehicle or a volume target. "We're in full compliance right now, and we know exactly how many battery-electric vehicles we need to sell" to meet California's standards, Kuniskis said. "Our plan that we're building right now will keep us in full compliance." California requires automakers selling 20,000 or more vehicles in the state annually to ensure that more than 15 percent of their vehicles release no emissions by 2025. Starting in 2018, the requirements that now apply to the six largest carmakers, all from the U.S. and Japan, will widen to the top 12, to include Hyundai Motor Co., Kia Motors Corp., Daimler AG, Volkswagen AG, BMW AG, and Japan's Mazda Motor Corp.
"The real $64,000 question at this point is whether or not zero-emission vehicles are going to be commercially viable," said Lyons, the Sierra Research analyst, who was a California state air-quality engineer. "More are getting sold now than have in the past, however it's still a far cry from the levels at which the regulations will require them to be sold."